This recipe helps to dispel that myth that certain comfort foods are gone forever when one gives up gluten and dairy. Remember swedish meatballs? 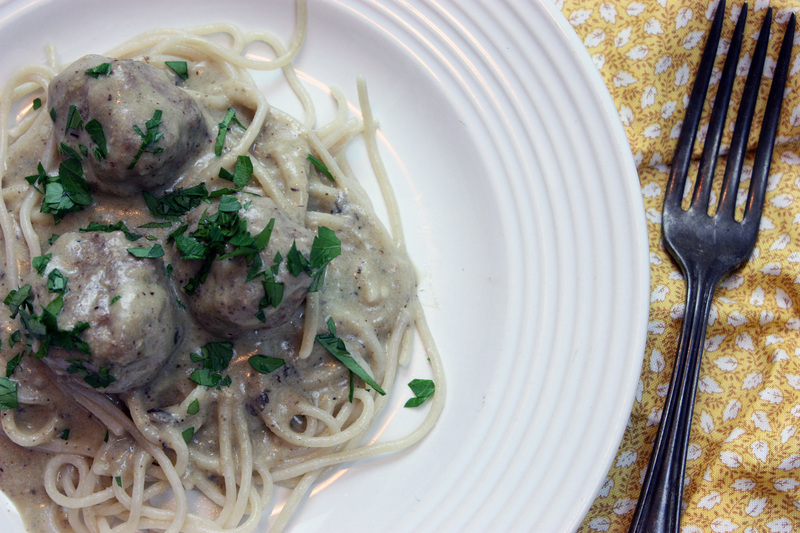 That creamy, silky sauce, coating delicious meatballs and a way-too-large plate of wide noodles? I do, although before I made this recipe, I hadn’t tasted swedish meatballs in several years – well before I went gluten-free. Even at their worst, (a.k.a. the “before I knew how to cook” swedish meatballs – processed powder in an envelope that you mixed together with the meat and some milk to make sauce) swedish meatballs still hold some nostalgia for me. My husband also loves the dish. So when I saw that Kelly over at The Spunky Coconut used cashews and lemon in place of sour cream in a dish (chicken paprika), immediately light bulbs went off. I knew I could make swedish meatballs. And so I made it happen the following night. I soaked cashews before I left for work, and came home to start the sauce. I did add a non-traditional ingredient in the sauce – mushrooms – because I thought it would enhance the flavor. I had a leftover grilled portobello in the fridge, so why not? Since I pureed the mushrooms in the sauce, no one was any the wiser. It’s an optional addition, but personally, I loved the boost of flavor. Once I had the sauce pureed and tweaked so that it tasted right, I worked on the meatballs. In the spirit of simplicity, I opted to bake them rather than cook them on the stovetop in batches. (The recipe already requires several steps – no need to complicate it further!) This allowed me time to make the pasta and warm the sauce, and then everything was ready to go. What I wasn’t prepared for was how good the result would be. The sauce was excellent. Creamy, satisfying, and full of flavor. I had to double-check with my husband for authenticity. (Since it’s been so long since I’ve eaten certain gluten and/or dairy-filled dishes, my brain tends to somewhat forget what the original tasted like.) He said the sauce was lighter than the usual sour cream version, but that this wasn’t a bad thing. (I promise you, it’s still plenty creamy.) We both fell in love with it a little bit more with each bite. This was one of those dishes where you wouldn’t find someone saying “This is pretty good for gluten/dairy-free” or “It’s different. Good, but different.” (I know we’ve all heard those statements once or twice before!) All our tastebuds knew was this was good eating. Soak cashews in enough water to cover overnight or around 8 hours. Drain and place in a blender. Add lemon juice and start blender to puree cashews. Gradually add about ¼ cup additional water and continue to blend until consistency is about that of thick sour cream. (Stop to scrape down sides of blender as necessary.) Add mushroom and nutritional yeast flakes and blend again until smooth. Set aside. Heat oven to 375 degrees. Line a rimmed baking sheet with parchment paper. Combine ground beef, lamb, almond flour, egg, flaxseed, allspice, cardamom, onion powder, salt and pepper in a large bowl. Mix with your hands until well-combined. If desired, check seasoning by making a tiny meatball and cooking on a skillet – taste and adjust seasoning as needed. Use a tablespoon to scoop out meat and form into meatballs with your hands. Place on baking sheet. You should get around 50 meatballs. Bake meatballs for 20 minutes or until cooked through. Meanwhile, heat ghee or oil in a large skillet over medium heat. Add arrowroot powder and whisk until combined. Add beef stock and vegetable stock and continue to whisk until boiling. Scrape the cashew cream from the blender into your skillet and whisk in. Turn heat to medium-low and heat until warmed through. Add onion powder and salt and pepper to taste. When meatballs are finished, add to sauce and stir to coat. If sauce is too thick, add additional stock and stir in as needed. Once everything is thoroughly heated, sprinkle nutmeg over. Serve on top of gluten-free noodles and garnish with parsley. I don’t think I’ve ever had swedish meatballs…of any variety. These look fun to try though! This sounds so good! Yum! okay, I really need to stop reading your blog after midnight I get so hungry! looking at all these wonderful dishes..this meatball dish looks divine a must try!